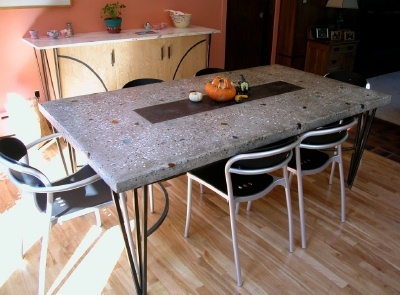 If you are thinking of building diy concrete countertops for the first time, you've come to the right place. This guide will walk you through each step from planning to sealing your diy concrete countertop. If this is your first attempt at making a diy concrete countertop, I would suggest you keep it simple and make a small table top or a bathroom vanity. Working with concrete isn't as easy as it looks. If you try a full sized kitchen concrete countertop without any experience at mixing, placing, and finishing concrete, you may be very disappointed with the outcome. 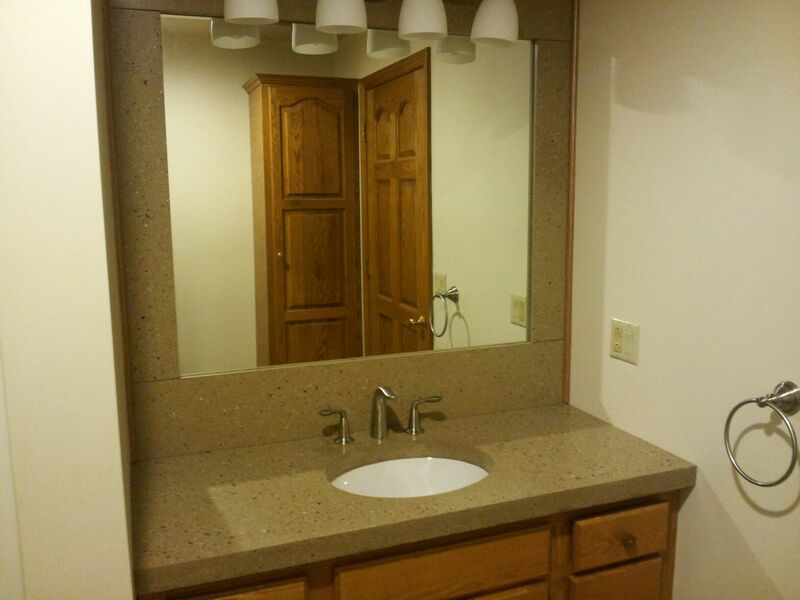 By keeping your first concrete countertop simple you will gain valuable experience as to how concrete feels when it is mixed and placed into the form, how fast or slow it dries, and how it feels if you are troweling or polishing the surface. Click on the links below for more in depth information on each subject. Should you do a poured in place concrete countertop or a precast concrete countertop? If you have a large countertop area and you don't want any seams, then a diy poured in place concrete countertop is the way to go. 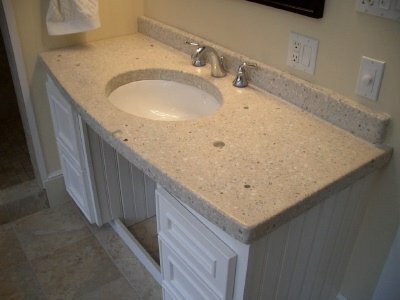 Pouring a concrete countertop in your kitchen or bathroom requires extensive preparation. Protecting the floor, cabinets, and walls is a must because concrete can be messy when it is poured. The kitchen or bathroom area will also be out of use for up to a week before it is done. Concrete is very heavy so pouring it in place means you don't have to lift it, transport it, and install it after making it somewhere else. A 2 inch thick concrete countertop weighs 25 pounds a square foot, so a 6 foot by 2 foot countertop weighs 300 pounds, too heavy for one person to lift. Making a precast concrete countertop in your shop or garage does have some benefits. Having a controlled environment where no other people are working means less chance of having an accident. Mixing and pouring the concrete is easier with no cabinets to work around and no finished flooring to spill concrete on. If you want a polished surface, doing this off site is also much easier. Making a template and the form for your diy concrete countertop are two very important steps for success. The template will ensure you have the exact dimensions if you are making a precast countertop and using the right forming materials will give you a smooth surface to apply the finish. There are many concrete countertop ready to mix bags on the market. If this is your first time making a concrete countertop, I would recommend buying one of these bag mixes that you just add water to. Pouring diy concrete countertops can be really fun. After all the planning and forming, now it seems like you are getting somewhere. If you are pouring a concrete countertop in place, then troweling the surface smooth by hand is the easiest way to finish the surface. This does require some skill troweling concrete for a flawless finish. If you are precasting your diy concrete countertop, then troweling the top of the concrete or polishing the bottom of the concrete in the mold is the best way to finish the countertop. Learning how to Polish will also be best done on a small piece of concrete to get the feel of the polishing process. This is probably the most difficult step for a do it yourself concrete countertop. There are many types of sealers out there, each with their pros and cons. Some will give you a matte finish, others will give you a gloss finish. Some resist heat and chemicals better than others. Some are easier to apply than others. I would suggest to keep it simple for your first one. Buy a sealer from one of the pros like Cheng and use a food grade wax to help protect it. Another good water based polyurethane countertop sealer is Surecrete Design Products XS-327 WB high solids hybrid urethane sealer. This sealer can be colored, thinned and applied with varying solids content to achieve different degrees of finish.